In the mid 19th century, the still-life genre had begun to shift from painting to photography. Props became less symbolic, more literal. 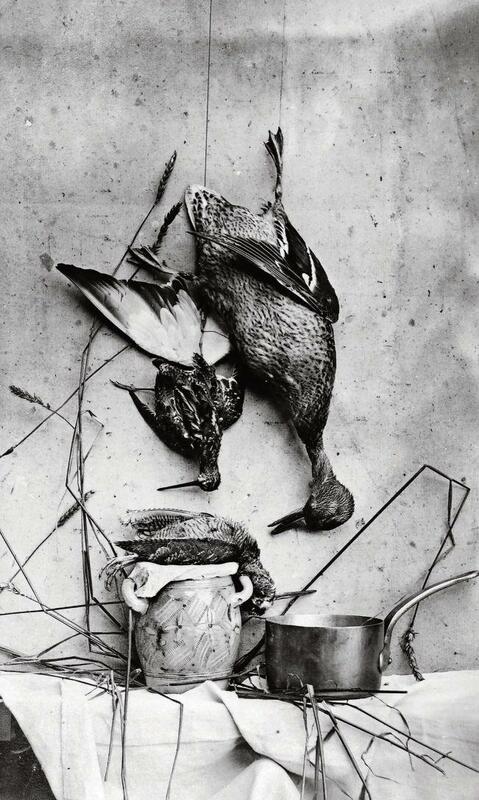 In Carey’s , which pictures meticulously hung birds, a saucepan suggests that the waterfowl will become food. Gone are the more magnificent piles of animals (symbols hinting at death, decay, or ephemerality). This is a particularly elegant example of using food in its raw form as still life; other examples from this period often lacked the grace of the paintings they were emulating, and could seem cluttered and grotesque. His work is reflective of the time, but in a way, very ahead. Perhaps Carey was purposely trying to forge a different identity for the art of photography— moving away from the symbolism of food in painting, while simultaneously pulling on its legacy.